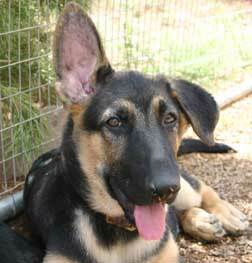 Puppy proof your house... before you bring your new German Shepherd puppy home. You must first "puppy proof" the area in which the German Shepherd puppy will spend most of it's time and then the rest of your home, outside included. There are several considerations you must think of first to make sure that nothing unwanted happens to your things or to your puppy. Try to see the area from the puppy's point of view. While I don't suggest that you have to crawl around on all fours, doing so does create a new understanding of exactly what your German Shepherd puppy may see. Especially which objects the puppy may see and that may be of interest, and what things are out of reach. If the German Shepherd puppy is to stay outside, then puppy proof the sleeping area / dog house for any potential problems - nails that may be exposed, loose boards, splinters or holes. Use your best judgment and go ahead and correct any problem before bringing your German Shepherd puppy home. If the yard is fenced (and this is highly suggested in any case of dog ownership) check for problems of any type in the fencing. Even more importantly, check for any openings or holes particularly at the bottom of the fence, near the gate area, etc. You would be surprised just how small an opening a German Shepherd puppy on a mission needs to get out and visit the neighbors cat. Check the fence posts for stability and the gate to make sure it works properly and latches securely. Also, it is best to invest in a lock of some sort to keep well meaning children out and your new GSD puppy in. 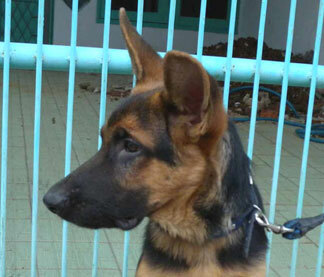 The safety of your puppy cannot be assured once it is outside of your fenced area without you. If you don't have a fenced yard and plan to use a cable run make sure that it is firmly attached to an immoveable object. A shock absorber of some type is also recommended to help absorb the pull when the puppy reaches the end to prevent injury. If using a stake, puppy proof it by making sure that it is placed in solid ground. Sandy or loose soils would be easy for the pup to pull out in a matter of time. Avoid chain tie outs since they are more apt to break over a short period of time due to day to day stress. Also, depending on where you live, be well aware of the threat of rabies. Keep the German Shepherd puppy current on all it's shots and be very cautious of leaving your puppy out unsupervised at all times. Also, puppy proof the area and be very aware of where you feed your GSD puppy as this may also entice unwanted animals into your yard. If your German Shepherd puppy is going to live indoors (highly recommended) make sure you puppy proof all low lying areas for potential hazards. Put up ALL chemicals (of any type) in areas that are inaccessible to your puppy. Antifreeze, cleaning chemicals, paints, etc. 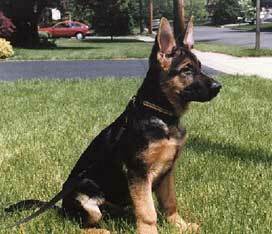 are all potential threats to your new German Shepherd puppy. Check the location on all power cords. It is best to put them out of the pups reach - underneath rugs and behind furniture is one way to start. Remember the saying : "out of sight, out of mind?" If you have any personal belongings you don't want the puppy to get, then put them up. Stuffed animals, shoes, clothing, figurines, low hanging table cloths and plants should ALL be moved to higher ground in the act of puppy proofing your house. Be aware that many common house plants are poisonous to your GSD puppy if eaten. Check with your veterinarian or poison control to find out which ones are poisonous and which ones aren't. Generally speaking, if you don't want the puppy to "get" a certain item, that item will be among the first to "get got" unless you move it. Supply yourself with a wide array of puppy proofed and approved toys - chews, chew toys, etc., to keep the puppy occupied during this instinctive, and sometimes destructive, teething period. Garbage cans seems to just hold some type of spell over small German Shepherd puppies (and some adult dogs too for that matter). Make sure that you train the puppies right from the beginning that the garbage can and contents are off limits. All the odors and objects within are more than enough to tempt any self-respecting GSD pup's desire. There are many dangerous items in there for them - poultry bones, glass and serrated can tops just to name a few. If you have a pool, puppy proofing applies to this area as well. It would be a very good idea to invest in a canine life vest . Above ground pools may be a little easier to restrict access to for you GSD puppy, but it is very important to make sure that the ladder is up, all pools decks are shut off to the puppy when not in use and that all pool chemicals and supplies are out of reach. Still, an inventive German Shepherd may find it's way in and no way out if you are not overly careful. In ground pools, spa and hot tub owners - please be aware of potential dangers as well. Please keep all securely covered or locked up when not in use. While it is important for the German Shepherd puppy to learn to ride in a car, it is also your responsibility to provide for his safety while in your car. Do not let the puppy ride in the back of a pick up truck by itself and do not let it wander around inside your car as well. It could easily turn into a projectile if you had to break suddenly or make an emergency lane shift of some sort. It is easy to restrict your dog by several methods while traveling with you. Puppy proof your car for traveling by providing your dog a crate, a car barrier or a harness of some sort to keep it in one area inside your vehicle. It is also important to keep your GSD puppies head inside the vehicle at all times even though they so enjoy hanging out the window like a crazed circus performer. Many injuries can happen, and often do, as a result of this practice. But if you don't mind the head out the window thing then please, do yourself a favor and invest in a pair of Doggles to protect your dogs eyes. Fire ants can be very dangerous to puppies and full grown dogs. If you have fire ants in your yard or live in an area that is prone to them read up about fire ant removal here. It is important to have a chosen veterianrian choosen either before you get your puppy or very soon afterwards. There are a number of factors which have to be looked at when choosing a veterinarian. Click Here for advice on choosing a veterinarian. Puppy proofing is not all that hard, but it does take planning, forethought and time. You and your German Shepherd puppy should enjoy getting to know each other without having to worry about any potential threats. Puppy proof first for safety!